The Infinite Professor Theorem | O'Really? If you took an infinite number of Professors, added some comedians, recording studios (instead of typewriters) and got them to record random radio shows you might just end up with a program like the Infinite Monkey Cage. 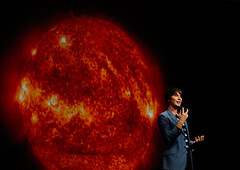 After a brief break, Physicist Brian Cox (pictured on the right with the sun shining out of his behind) and Robin Ince return for a third series of their phunny physics show which takes a “witty, irreverent look at the world according to science”. The next program will be broadcast Monday 15th November on BBC Radio 4 at 4.30pm and is available as a podcast too. Worth tuning into if you like your science comical, physical and audial. Is irreverance supposed to appeal to younger audiences? Or perhaps the BBC just recycles an identikit blurb for popsci programmes that has remained unchanged for decades?